How to Find Correct Amount of Insurance? As our site readers know that we have always advocated going in for a term insurance plan as compared to insurance plans linked with investment. Now we come to the crucial question that what is the correct amount of insurance required. 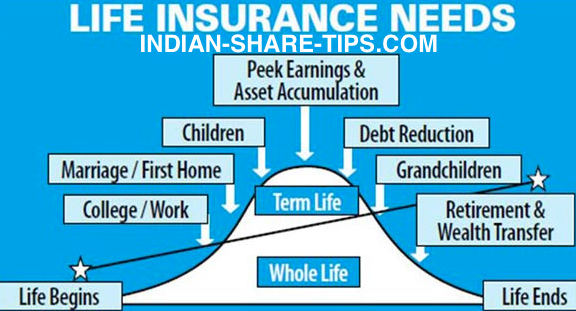 First remember that insurance is only to replace the cash generating persons ability (cash flows that earning member would bring to meet family’s expenses) which remains till 60 years and thus if you take insurance till 60 years then it is good enough as till then your children are settled in life and your savings may have had grown. First you have to find the life expectancy of your wife as we consider that children are settled in life. The multiplication factor of 1.4 caters for the inflation monster. As one will realise that the amount may be reduced as earning member has died and thus the monthly expenditure will also reduce accordingly.